Downloading videos from YouTube means you can watch them on a best laptop or best tablet without an internet connection, which is ideal for keeping yourself entertained on planes, trains, and trips to places without reliable 4G or Wi-Fi. Downloading videos is also great if you have a mobile plan with a limited data allowance. You can download them to your phone using your home Wi-Fi, and watch them on the move without risking going over your data allocation. It's surprisingly easy to download videos from YouTube and other video hosting sites – and you can do it free. 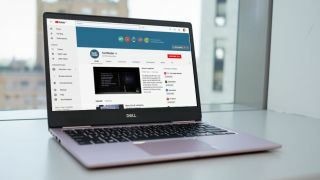 YouTube itself provides some tools for downloading videos (on both desktop and mobile), and there are third-party tools that can do the job as well. Read on to find out how. Using third-party apps to download YouTube videos is against Youtube’s terms of service – which state that you are only able to stream videos directly from its servers. Downloading YouTube videos also opens you up to potential copyright infringement unless you have permission from the copyright holder, it’s in the public domain, or you own the video yourself. That said, YouTube does offer some ways to download videos through its web service and its own apps. In this guide we’ll explain how to do this, and take you through the other options available for iPhone, Android, Mac and PC. To download YouTube videos to a Windows PC, start by downloading and installing 4K Video Downloader. This versatile software is completely free, and can download whole playlists, as well as 360-degree and 3D videos. When it's done, check the box marked 'Launch' and click 'Finish'. Open your web browser, find the video you want to download from YouTube and copy its URL from the address bar. Then return to 4K Video Downloader and click the green 'Paste Link' button at the top left. The software will retrieve information about the video and give you a choice of quality options. These will vary depending on the quality of the original video, but the software can download YouTube videos in 4K if it's available. 4K Video Downloader will allow you to download whole YouTube videos, or just rip the audio. Choose your preferred selection using the drop-down menu on the left, then choose a format using the menu on the right. We prefer MP4 for our videos, because it gives a good balance of quality and file size – and will play on basically every device. You can also choose where the downloaded video should be saved using the 'Browse' button at the bottom. Once you're happy, click 'Download'. The YouTube video will now be downloaded for you. If there are other videos in the creator's channel, 4K Video Downloader will ask whether you want to download those as well. It can download up to 24 videos at once. Once the video has finished downloading, you can find it in the destination folder, or right-click it in 4K Video Downloader and select 'Play'. Unless you adjust the settings, the video will stay in this list until you choose to remove it – even if you close and restart the software. If you have a YouTube Premium subscription, you'll enjoy various perks, including the ability to download videos to watch offline without third-party software. You can do this using the YouTube, YouTube Music and YouTube gaming apps. Bear in mind that you can only watch the downloaded videos using the app – you can’t move the video file to a different device, or watch it with a different player. Start watching a video, then tap the ‘Download’ button (a gray arrow) under the player and choose a quality setting. Once the video has downloaded from YouTube successfully, you can find it in your Library or Account tab. You must be signed into your account to watch downloaded videos, and you can't respond to videos with comments or likes when watching them offline.